Hello! I’m Arthur, an Erasmus student in Prague. Ahoj! Jsem Arthur a studuju v Praze. I come from France and I study medicine. Why did I choose to come to Prague? Well, you know, some men love women for their beauty, some women love men for their money. I’ve chosen Prague because it is beautiful and cheaper than Ireland. Quite a superficial way of thinking I must say, but do I regret my choice today? Absolutely not. According to a French stereotype, Prague is a beautiful city with the most beautiful girls. Unfortunately not everyone knows that it is also the capital of the Czech Republic and that you have to speak Czech with those girls. That’s to say how little I knew about the Czech Republic, Prague and the Czech people before I came here. So let’s see what the Erasmus programme in Prague can teach you. Living in a dorm means being in contact with a lot of other Erasmus students and I love it. I would never change my little room for a flat, despite the compassionate looks that Czech friends give me when they hear the word “dormitory”. Spanish, Italian, and Portuguese people are living in my corridor. They come from the south of Europe and bring the sun in their smiles. They have the bad reputation of being noisy, but they are just extremely sociable, cheerful people, and they live as a group. On countless occasions I have been offered a meal in their crowded kitchen when they invited the whole corridor to a tasting of the Mediterranean diet. Polish, German and Estonian people are my neighbours from the North of Europe. They seem more serious and calm, almost strict, but they are in fact the warmest people I know. They were apparently born with the disposition to take care of one another. They also like to party, but in little groups. We share stories, movies, vodka and games, and we dance in a cosy room. The truth is that I felt alone in my own country, but since I came to Prague, I have had my Polish family and we take care of each other. 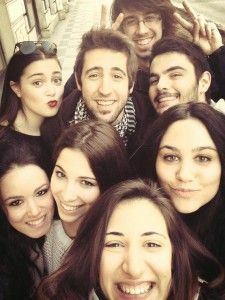 Despite their different nationalities, Erasmus students could be described as one nation – a nation of people sharing the experience of being away from home. It doesn’t matter where we come from: what matters is that we are here now. We stay here for a limited amount of time and we want to make the most of it. Meeting each other, partying, learning languages, visiting the country, traveling around, we keep in mind that we want to enjoy our stay. And we do so in a lot of different ways, not only by getting drunk and riding night trams while singing songs. I often hear people saying that Erasmus Students are careless, drunk party animals. In such cases, I want to ask those people: “Does that mean that the average Czech youth is a sober paragon of virtue?” We are students like any other – some of us like to party, some of us like to watch a movie at night, and some of us have so much work that we hardly do anything else but reading books. We are human beings like others, we travel Europe and we learn that stupid people exist everywhere. Daily the beautiful streets of Prague are torn apart by two human streams: the loud, excited tourists and the quiet, preoccupied inhabitants. The Czech people might be loud too, but as my mind cannot catch the meaning of every word, I live in silence. Erasmus students are caught between the two streams; they are a bridge between ephemeral tourist and permanent resident. An Erasmus friend told me last year in France: “My only regret is that I did not learn the language”, so I tried to learn some words and sentences, and eventually, people who usually looked neutral and inexpressive gave me large smiles and advice on pronunciation. Trying to speak Czech is like saying: “Hey, I’m a clumsy Erasmus student, but I like your country and I want to communicate with you.” It changes everything. Yet, even without learning Czech, it still happened to me that some young local people who were able to speak English invited me to share some homemade slivovice with them. A friend told me that the Czech people are like walnuts – they have a hard shell, but if you get under the shell, there are very good things inside. “Hladím kočku” and “Nespíš u nás”. My Czech friends would laugh at me when I tried to say these and their imagination got immediately triggered! The connections. Thanks to the amazing involvement of some Czech students, parties, social events, trips and language classes are organized for the Erasmus students. It is because of these Czech students, who work their life away quietly for the Erasmus folk, that our stay is so wonderful. We should be grateful for that. My new Erasmus neighbour has been out every day and night in the week since she arrived. As for myself, I went to Kutná Hora, Český Krumlov and Třeboň. Some other friends went to Budapest and Krakow… In Prague I discovered the opera and I was invited to sing in the Charles University choir. Other Erasmus people were invited to join an orchestra, to learn how to cook Czech food, others were going to the weekly Czech Cinema movie night. In general, the stream of invitations was endless. Prague is a dynamic city, full of opportunities and full of beauty. When you talk to an Erasmus student about them, the main idea you get is that the Czech people are strange. On the one hand, they are very discreet and polite, the city is very clean and the subway is very quiet. The people seem almost withdrawn, close-minded and indifferent to others. 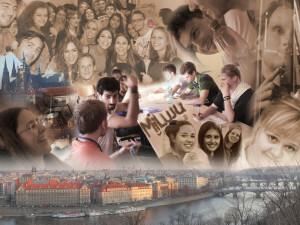 Some students think that the Czech people care mainly about their own life, about their own city and their own country, and that they focus on their own world. If someone ever tries to disturb this little cocoon, they can get very nervous and have strong reactions. On the other hand, they can be very cheerful, optimistic and friendly. One would say the people are still influenced by the communist regime and the Russian occupation. It is as if the Czech people did not like tourists because they are a kind of new invasion. Millions of strangers are coming to Prague and in a way impose themselves on the locals, as they don’t bother about speaking Czech and expect that every Czech person would speak English. My Czech Friends are enigmatic people. I met three of them in France very quickly, then I never heard about them for several months and I thought we lost contact. I was happily surprised that they got back to me by email, welcomed me in Prague and helped me with everything. I have two other friends I met while traveling in Czech Republic and out of thirty Erasmus students, they were the best. I came to think that all my Czech friends travel and I believe that’s why I met them. So, my message to the Czechs students: go for Erasmus! See you soon! FForeign: How do you spend your free time in Prague? Rubrika: Kolem světa, Studentský život.